Wright Asphalt’s Pavement Maintenance Products provide environmentally-friendly alternatives to traditional pavement maintenance products, while offering high-quality and superior performance. Utilizing our unique TRMAC™ process, Wright is able to produce products that have the same storage stability as conventional binders, can be used in standard equipment, are user-friendly and outperform traditional products. Exposure to ultraviolet sunlight, extreme temperatures and daily traffic ages asphalt faster, causing potential problems such as cracks, ruts, potholes, loss of skid resistance and raveling. By maintaining pavement on a routine basis, the life cycle is lowered, pavement life is extended and future deterioration is delayed. Every pavement maintenance product that Wright creates is put through rigorous testing, quality control and certification before ever being introduced to the market. Our pavement maintenance products have been specially designed and modified for each region’s unique specifications. We also provide support and training on how to properly use these products. This unique combination of products and services is one of the reasons that Wright is considered one of the industry leaders and sets the standard for quality and performance. Wright Asphalt products can restore pavement to meet or exceed your maintenance or performance goal standards. They are also easy-to-use and environmentally-friendly. All specifications are performance based. AC20-5TR is a polymer modified asphalt that contains a minimum of 5% whole scrap ground tire rubber. This whole scrap tire rubber is completely digested and integrated into the asphalt cement using the TRMAC™ process prior to modifying with SBS polymer. The final product is a homogenous, stable material that is shipped from the manufacturing terminal to the jobsite. It is singular in composition, resists the effects of aging and weathering and has been formulated for use in higher traffic volume applications. AC15-5TR is a polymer-modified asphalt that contains a minimum of 5% whole scrap ground tire rubber. This whole scrap tire rubber is completely digested and integrated into the asphalt cement using the TRMAC™ process prior to modifying with SBS polymer. The final product is a homogenous, stable material that is shipped from the manufacturing terminal to the jobsite. It is singular in composition and resists the effects of aging and weathering. Due to the adhesive strengths, chip retention and ease of handling, the AC15-5TR material is used with both pre-coated and uncoated aggregates. AC10-2TR is polymer-modified asphalt that contains a minimum of 2% whole scrap ground tire rubber. AC10-2TR is used for “hot-applied” chip seal applications and has been formulated for use in lower traffic volume applications. AC12-5TR is a polymer modified asphalt that contains a minimum of 5% whole scrap ground tire rubber that is specifically formulated for use during early and late season applications. This product is SBS modified and then further enhanced to provide the added adhesive characteristics that enable it to overcome climatic temperature swings. AC12-5TR is designed to provide the same bonding strengths and long-term “wear-ability” when the climatic conditions do not warrant the use of other “hot applied” seal coat liquids. For most “hot applied” chip seal binders, nighttime temperatures falling below 60°F creates potential problems by not allowing ample cure time to acquire the necessary bond between binder and rock. 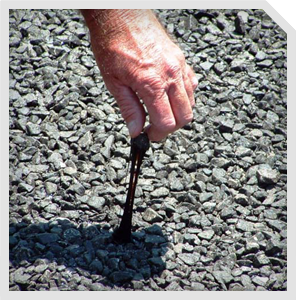 MC-800TR is a tire rubber modified asphalt cutback used for “hot applied” chip seal applications. MC-800TR has been designed for use on compacted road base to provide a durable chip-sealed road surface. Once the tire rubber is fully digested, the base asphalt is further modified with diluents to provide a homogenous adhesive that resists the effects of aging and weathering. The MC-800TR penetrates the road base surface and bonds the cover chip into the road base, creating an excellent water-proofed wearing surface. TRMSS is an emulsified tire rubber modified surface sealer and is intended for use on asphalt pavements that need sealing due to oxidation and weathering. TRMSS is manufactured using the TRMAC™ process, which digests whole scrap ground tire rubber into the asphalt cement. It is then emulsified into a water-base liquid “surface sealer”. This sealer provides a water barrier and wearing surface that withstands the rigors of weather, UV degradation, oxidation and traffic wear. Tire rubber contains natural and synthetic polymers. Through the TRMAC™ process the tire rubber is digested into the asphalt cement allowing the natural and synthetic polymers to become integrated in the form of oil within the base asphalt cement. These newly formed modifiers now act as compatibles and enhancement modifiers for additional polymer modification to the hybrid end product. The unique synergy between polymers and the tire rubber components yield an asphalt binder that exhibits excellent adhesion and cohesion characteristics beyond standard polymer modifiers.